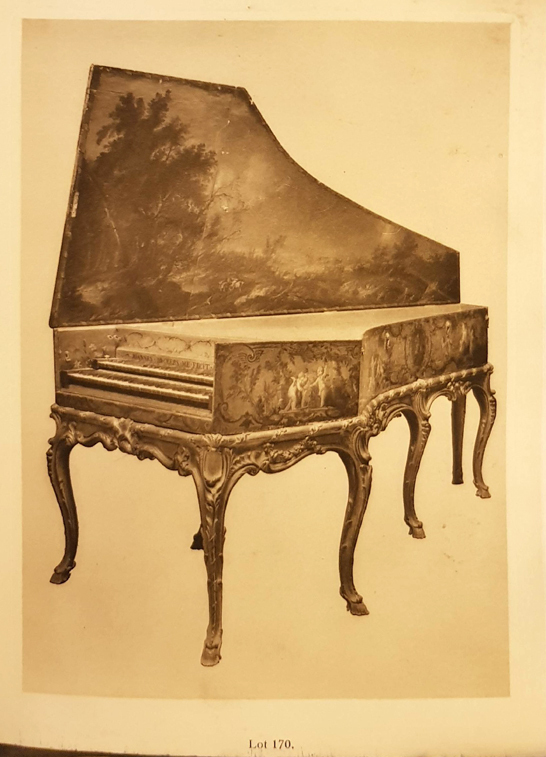 The description and the image of the Franco-Flemish harpsichord as lot 170 in the Sotheby's sale catalogue for 13 May, 1927. 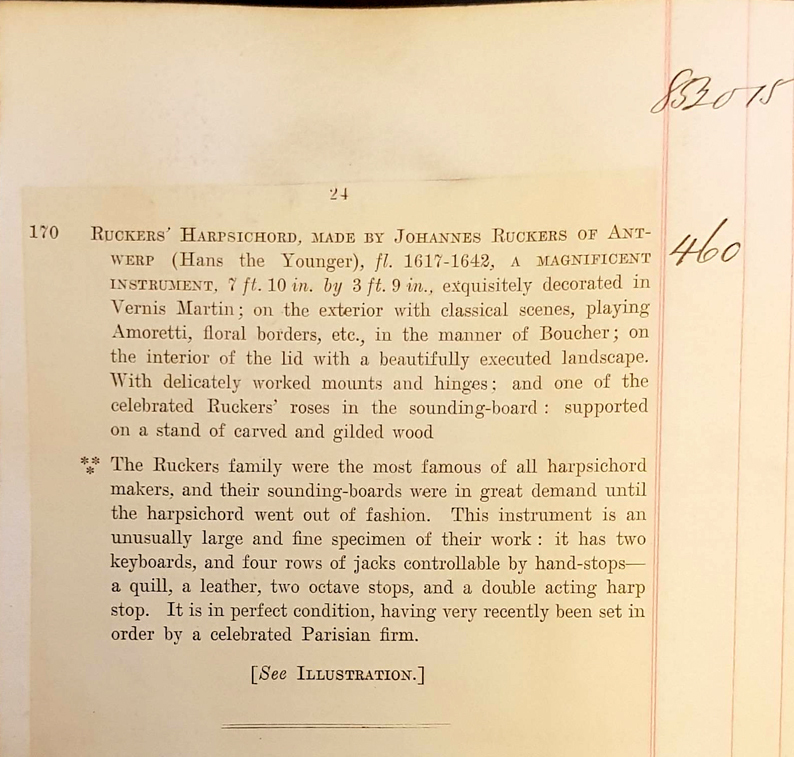 This is clearly a description of the same instrument represented in the photograph in the archives of the Russell Collection at the University of Edinburgh (see The modern history of this harpsichord). It seems likely that Sotheby's took this photograph in the first instance. This catalogue therefore fixes the date of the photograph and the date of the sale of the instrument, probably to William Randolph Hearst, who bought it as part of the furnishings for his castle in San Simeon, California, USA. But from our present knowledge of this instrument and its characteristics we are led to ask: "How accurate is the description of the instrument in the Sotheby's catalogue, and what does it tell us about the modern history of the instrument?". Compared to a 'standard' Ruckers double-manual harpsichord it is, indeed, 'an unusually large' example - and this is but one of the reasons that it cannot be by any of the members of the Ruckers family. The large size of the instrument is also one of the features that adds greatly to the impression of richness and splendour. It is clear that the grand ravalement of 1786 carried out by Barberini/Hofmann, which extended the treble compass from d3 up to f3, also added a peau de buffle row of jacks and a genouillère which enabled the player to swell from the quiet peau de buffle, to the full plein jeu of 2x8' plus 1x4', without the player needing to take his/her hands off the keyboard. Normally this is accomplished by coupling the knee levers placed below the baseboard and passing into the keywell below the keys to a series of roller bars inside the keywell. These roller bars are connected, in turn, to a set of coupler bars which transfer the motion to a series of external rocker bars. However, the Franco-Flemish harpsichord was given a totally unique type of genouillère found in no other historical instrument. There is now virtually nothing remaining of this unique genouillère it once had, but there are clear indications that extra blocks inside the keywell under the keyboards once functioned as supports for this important and interesting genouillère mechanism. What makes the genouillère of this instrument unique is that there were never any rocker bars on the spine side of the instrument. Coupling the movement of the knee levers to the registers was accomplished by some kind of unknown internal mechanism contained entirely inside the instrument underneath the lower-manual keys. Because of its unique character, the removal of the genouillère from this instrument must be considered one of the most serious losses of important historical information carried out in the modern period, and one of the most serious sins of modern restoration practice. Although Dolmetsch is often credited with being a genius and the founder of the current early music revival, he has also to be given the responsibility for some of the most serious malpractices of modern restoration history as well. The catalogue entry tells us that, in 1927, it had four rows of jacks, whereas it only had 3 rows in 2002 when it came to my workshop. Here, it is stated that the registers were 'controllable by hand-stops' and two of these are visible at the left-hand (bass) side of the keywell. These also did not survive to 2002. In addition it is clear that there are no knee-lever pommels visible below the stand to indicate that it had a genouillère system in 1927. Therefore the genouillère must have already been removed by Tomasini or Arnold Dolmetsch prior to the taking of this photograph. Given Tomasini is well-known for his conservative restoration practices, and that Dolmetsch completely removed the genouillère on the 1764/83 Goermans/Taskin harpsichord in the Russell Collection of Early Keyboards at the University of Edinburgh and replaced it with a pedal system, it seems highly probable that it was also Arnold Dolmetsch who removed the genouillère from this instrument as well. Since it is stated in the catalogue entry above that one of the registers was in leather, it seems highly likely that it is the peau de buffle stop that is referred to here. It needs to be pointed out that the peau de buffle register guide had been removed (by Roberto de Regina in 1971?) when the instrument came to me for restoration. This meant further that the peau de buffle jacks were missing, the lower-manual peau de buffle upper register had been replaced with a blank rectangular bar of South American hardwood, and the original peau de buffle upper register guide had been re-used as one of the lower guides. But all of this seems irrelevant to the above description since it is totally unclear how the instrument could possibly have had 'two octave stops', since this would create problems of the height of the 8' jacks one of which would have had to have been lowered to pluck the octave strings at a lower level. From the surviving jacks and keyboards there is nothing to indicate that either the lower-manual or the upper-manual jacks had been reduced in height in order to operate on the low-level 4' strings. It is therefore very doubtful that this part of the description is accurate. The 'double acting harp stop' referred to here probably means that the width of the leathers on the harp-stop (usually called a buff-stop by modern organologists) battens were all of exactly the same width so that either of the two 8' registers could be 'harped' using this stop positioned either to the left or to the right (in historical instruments the harp stop operates only on the upper-manual short set of 8' strings). Is this unusual disposition also to be laid at the feet of Arnold Dolmetsch who seems to have altered it from the original system? At any rate, if there were two octave registers, which row of jacks plucked the second set of 8' strings? There is clearly some kind of error or misunderstanding in this description of the disposition of the instrument in the Sotheby's catalogue. It is also not clear how the instrument could have 'very recently been set in order by a celebrated Parisian firm' if it had been in the ownership of Mrs. H.E. Crawley for at least the previous 10 years or so. There is clearly a number of problems with the description provided by Sotheby's in 1927. I am extremely grateful to Brian Blood who discovered the description and image in the 13 May, 1927 Sotheby's London sale catalogue. He kindly pointed these out to me and sent me the above images.